This cute mystery will delight children with its lovable animals and colorful illustrations. A boy and his monkey are the town’s greatest detective team in The Adventures of Alex and Angelo: The Mystery of the Missing Iguana. This cute book, with its simple, colorful illustrations and easy-to-read words, will delight children. Alex and his pet monkey, Angelo, are inspired by Sherlock Holmes to be the greatest detectives in their town. They charge twenty-five cents to solve each case and are saving up to buy a mountain bike to help speed up their business. The story begins with Alex excited about “take your pet to school day.” But when it’s classmate Darren’s turn for show-and-tell, his pet iguana has disappeared. Alex and Angelo are on the case, to the cheers and excitement of the students. Novella Genelza’s illustrations are anime-inspired computer drawings. They include bold, solid colors with some simple texture and movement lines. The illustrations lack shadows, and therefore dimension, as is common in computer illustrations. Some more texture, such as in the animals’ fur, could add depth and interest to the illustrations. 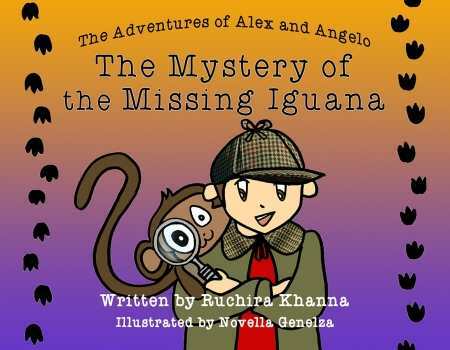 Children are sure to enjoy the simple mystery and color-blocked illustrations in The Adventures of Alex and Angelo: The Mystery of the Missing Iguana.